Man claims shaking hands with women is "patronising". 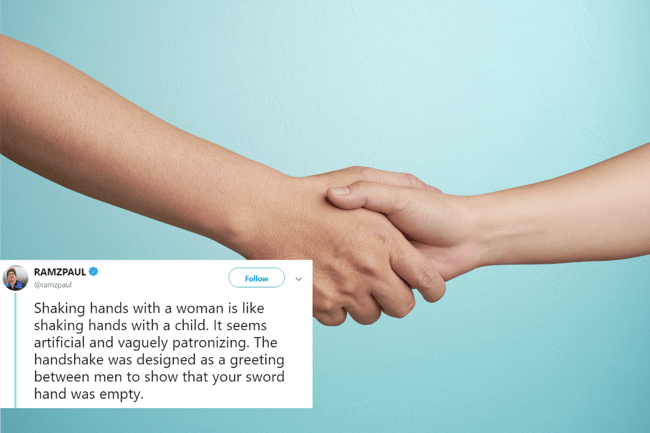 This man's horrible tweet about shaking hands with women is the worst thing you'll read today. There is a man on the internet who would like you to know that shaking hands with women is like “shaking hands with a child“. Posting to Twitter, YouTuber Paul Ray Ramsey shared that he thinks it’s better for men to hug women rather than shake their hands because they are too “delicate”. Seriously, we can’t make this sh*t up. ¯\_(ツ)_/¯. “Shaking hands with a woman is like shaking hands with a child. It seems artificial and vaguely patronising,” he wrote. “The handshake was designed as a greeting between men to show that your sword hand was empty,” he continued. As expected, Paul’s tweet received a lot of attention from people from every corner of the internet. And high heels were invented for men originally. October was originally the eighth month in the year. Things change. It’s not 1543 anymore my man, you’re gonna need to deal with that somehow. Funnily enough, Paul is the same man who tried to mansplain a woman’s own height to her. 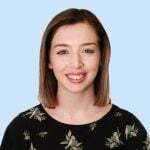 After sharing his tweet about shaking hands with women, Twitter user Amy responded, “Cool I’ll just slap you in the face then,” before joking that she was seven and a half feet tall. As the conversation continued, Paul then attempted to prove that Amy wasn’t in fact seven and a half feet tall – because obviously – by creepily digging up her wedding photos and drawing some trigonometry over the top of it.